Described variously as the Kashi of the South, the Rome of the East and the pearl of the Orient, Goa, located on the west coast of India, is renowned for its scenic charm, its beaches, and the architectural splendour of its temples, churches and old houses. With its sun-sand-surf leitmotif it is also the land of the lotus-eater, a tourist's paradise of fun and frolic, raves and revelry. But Goa is more than just the world's favourite holiday destination. Its unique history, shaped by the various dynasties that ruled it—the Rashtrakutas, the Kadambas and the Bahmani Muslims, before its 450-year-long occupation by the Portuguese from 1510—has given it a distinctive flavour, a different rhythm, an easy cosmopolitanism. 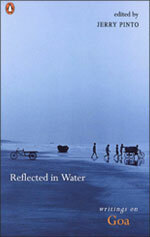 Reflected in Water is a collection of essays, poems, stories and extracts from published works that bring to life both the natural beauty and the changing social and political ethos of India's smallest state. From Mario Cabral e Sa's delightful take on the earliest Portuguese women to come to India to Gita Mehta's description of hippies at Calangute, from Alexander Frater's mesmerizing account of Goa in the monsoon to Manohar Malgonkar's ode to the Mangeshi temple, this anthology celebrates the irreverent and the sacred in equal measure. Teotonia R. de Souza's profile of the little-known ‘opium smuggler who tried to liberate Goa' is as captivating as Frederick Noronha's portrait of Abbé Faria, eighteenth-century priest, mesmerist and revolutionary, and one of the region's most famous sons. While Antoine Lewis fleshes out Goa's culinary delights, Frank Simoes pays a tribute to feni, the quintessential spirit of the place. Naresh Fernandes's obsessive search for the elusive humerus of St Francis Xavier echoes Vivek Menezes's quest for a painting by F.N. Souza, arguably the greatest painter the state has produced. And various aspects of Goa's history and society, arts and architecture engage the interest of writers as diverse as William Dalrymple and Graham Greene, Maria Couto and Armando Menezes.